Lots of things in life seem to come down to technique. 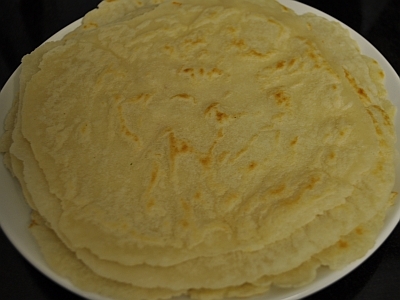 The following recipe for GF flour tortillas is all about technique. I was determined to have thin tortillas and was disappointed to learn that flour tortillas thicken during cooking. I discovered that I must roll the dough gossamer thin. I tried my aluminum tortilla press…very disappointing…uneven and nowhere near thin enough. Perhaps a cast iron tortilla press would behave better? Next, I tried hand rolling. Most recipes recommend a lightly floured surface. But, I wanted smooth tortillas without a flour residue. 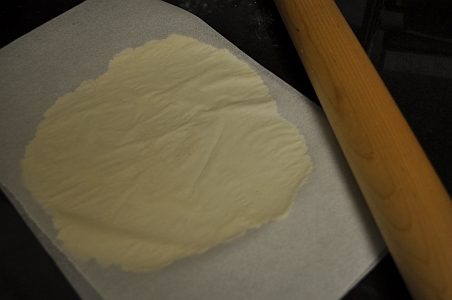 Finally, I tried a technique I have used in the past to make very tender pie crusts: I rolled out the tortillas between sheets of parchment paper. Worked great! 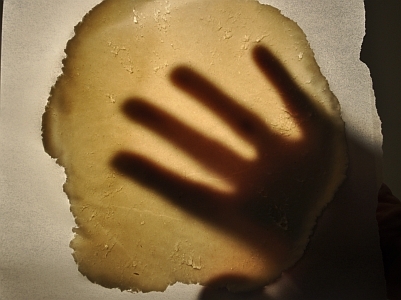 The next hurdle, was learning how to remove paper-thin tortillas from parchment without tearing them. Ahhh…the solution was to peal away the top sheet of parchment paper, turn over the paper with tortilla still attached, and place it onto the hot skillet or griddle. When the tortilla hits the pan, it adheres to the hot surface. Peeling off the paper becomes effortless. Success! I love it when experimentation produces a simple, repeatable process. At some point, they can be rolled too thin. But, as you can see when backlit by a lightbulb, this unbaked tortilla is thinner than you might aim for, but it turned out just right. To get it right, note in the recipe the quantity of dough in each ball and the diameter of the rolled out circle. I used my first half batch of flour tortillas for homemade mu shu chicken. It was the first time our family has enjoyed this dish in years. Last night, I made homemade beef fajitas with all the fixings. YUM! Again, it was a treat my darling has not enjoyed in long time. I plan to prepare a few batches of the dry ingredients and shortening for storage. With a scoop of dry mix and some warm water, we would never be more than a few minutes away from fresh GF flour tortillas. Makes 12 to 15 tortillas. 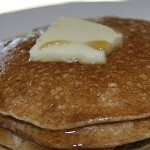 Heat a skillet/griddle to 350 degrees F. Add ½ tsp oil and wipe pan with paper towel. In a mixing bowl, combine flour, fiber, baking powder, salt, and mix. Add shortening and work into dough to form course crumbs. Add water and mix until blended well. Take 2 Tablespoons of dough and roll it into a ball. Using a rolling pin, roll out each ball between parchment papers to about 8-10 inches across. Remove top layer of parchment paper. 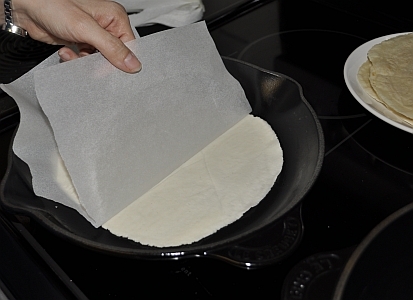 Pick up the remaining parchment with tortilla attached, turn it upside down, and place it evenly onto the heated surface. Begin along one side and remove paper carefully, leaving tortilla in pan. Allow tortilla to bake for about 1 minute and turn it over with a spatula. Cook for more 30 seconds. Remove to plate. Use immediately or store in zip top bag in refrigerator. Reheat in the microwave briefly for 10-15 seconds. Thanks for the recipe and the tips. I received a tortilla press for Christmas last year, and I still can’t make a gf tortilla that doesn’t resemble a frisbee, crepe, or pancake. I’ll try your recipe and method on the stove top. Glad you have found your blog! So glad I could help out on your quest for a tender and delicious flour tortilla. btw: I like your blog. Congratulations on completing your first triathalon – what an accomplishment! MMMMMMMM,..Your gf tortilla’s rock!! They look stunning! I cook & bake gf since june 2010 & I love it! Come over & check me out! 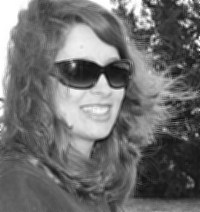 You live in a beautiful city and I enjoyed looking at your blog. Thank you for your kind words. I would love to have a good recipe for CORN tortillas! Your flour tortilla technique is fantastic. I like thin tortillas, and you are so right about them falling apart. Love your website! So where do I find or how do I make the “3 cups Better Batter Gluten Free Flour” called for in the recipe? That’s a great question, Linda. Better Batter Flour is a flour mix available from betterbatter.org or from Amazon. Perhaps you can even find it locally although I find there are not many resellers in my area. It is also possible that you could try substituting another rice based flour mix (although I have not tested this). I would love to know how your tortillas turn out! You are our family hero!!!! I can’t make them fast enough before my daughter steals them off the plate! Burritos for lunch today! A much missed treat for our family! Thank you!